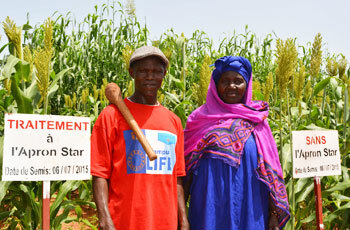 Peer-to-peer learning among farmers is helping spread new concepts and techniques of sorghum and millet production among farmers in Sikasso and Mopti regions of Mali. It is also facilitating farmers’ access to production systems of these commodities. To facilitate cross-learning, a series of farmer exchange visits were held during a Farmer Field School (FFS) and involved not only the targeted producers but also producers from neighboring villages outside of the project facilitating these efforts. 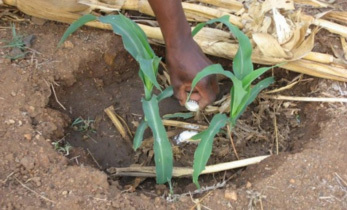 Integrated management of Striga and soil fertilization: The intercropping of sorghum with cowpea, or millet with cowpea provides effective management against Striga and contributes to improved soil fertility. 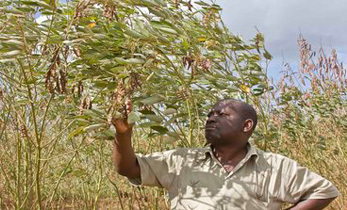 Cowpea has three notable impacts: it fixes atmospheric nitrogen, acts as a cover crop to help retain moisture and acts as a trap crop for management of Striga. Varietal testing: In 2015, hybrids and improved varieties such as Fada, Sewa, Pablo and Grinkan Yeraiwolo were compared to local varieties in Sikasso and Toroniou in Mopti. After nearly two years of testing, farmers have accepted the improved varieties in view of the advantages linked to the use of hybrid seeds and improved production techniques. Microdosing: This is a practice that encourages smallholder farmers to use small amounts of fertilizer at critical stages of crop growth to maximize yields. 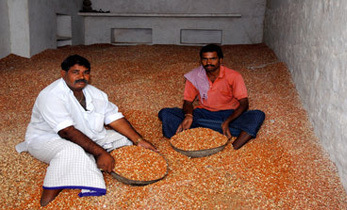 The overall input requirements are reduced thus helping resource poor farmers. 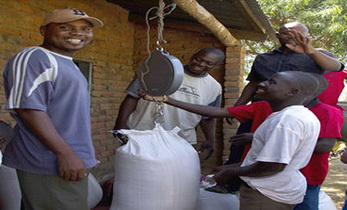 “Traditionally, for a hectare of millet/sorghum, a farmer uses three fertilizer bags (two bags of Di-Ammonium Phosphate [DAP] and one bag of urea) ie 150 kg in total. With microdosing, 35 kg of fertilizer are sufficient to cover one hectare. This greatly increases the economic value of production,” said Mr Daniel Kamate, Catholic Relief Services (CRS) supervisor, Koutiala. Microdosing is now leading to large benefits in yields and incomes. However, this technique has high labor requirements. 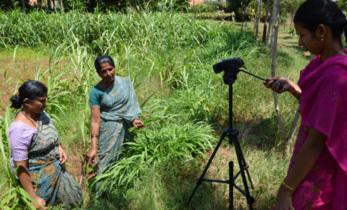 FFS – a group-based learning process: FFS brings together concepts and methods from agroecology, experimental education and community development. During FFSs, farmers carry out experimental learning activities that help them understand new technologies and the ecology of their field. The knowledge gained from FFS main plots, through ToT (Training of Trainers) will be replicated by participants (FFS Facilitators) in their own villages. A ToT is organized around 5 villages, each village providing 10 participants. These people organize in groups of five each, with each group forming a replication plot having technology similar to the main plot. Each group will reach out to between 25 and 30 participants who meet every two weeks for sharing information about different topics related to the production of millet/sorghum. 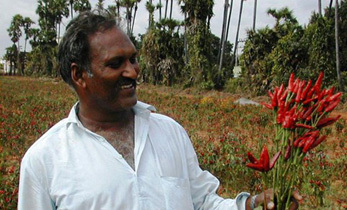 The training on both levels (ToT and secondary plot) are season-long – from land preparation to harvest. 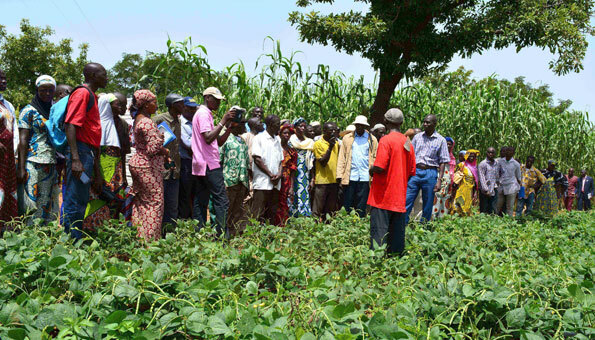 “If your crop just feeds you for a season, it’s time for you to change jobs,” said Mr Makono Kone, sub-sector chief of the National Directorate of Agriculture, Sikasso, to farmers in the municipality of Fama (Sikasso). The exchange visits were held from 27 September to 4 October and were organized as part of the Africa RISING large-scale Diffusion of Technologies for Sorghum and Millet Systems in Mali (ARDT_SMS). The field days were organized by CRS (a project partner).